WE shall now cross the Mediterranean sea to Italy. The westward course of civilization has left its marks in Italy. We found at Paestum, south of Naples, one of the best preserved of Greek temples located on the coastal plain near the sea. Here there was no overwash of erosional material or accumulation of dust from wind erosion, and no gully erosion in the plain. We walked on the same level as the Greeks who built the temple 2600 years ago. But population pressure in Italy under its smiling climate and blue skies has pushed the cultivation line up the slopes to dizzy gradients and caused the building of villages on picturesque ridge points. In Italy there are 826 persons per square mile of cultivated land, while in the United States, there are only 208. This method of comparison of population density gives us the advantage because of our vast grazing lands that support great herds of livestock. But if we had the same density of population per square mile of cultivated land in the United States as has Italy, we should have 520 million people instead of our 130 million. This give us some idea of the relative densities and pressures of population upon the land and accounts for the intensive use not only of the plains, but of the slopes up to steep gradients in Italy. We haven't space to tell the details of how the Pontine Marshes, that for 2000 years defied the efforts at reclamation of former rulers of Italy, were successfully reclaimed recently. This former pestilential area has been drained and rid of malaria and it is now divided into farms equipped with reinforced concrete houses of attractive design, families are established free from perils of malaria and safe in the security of their land. 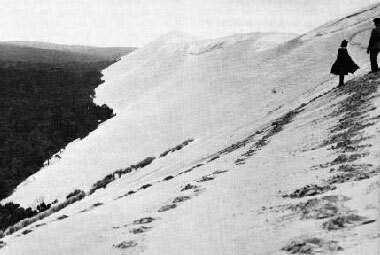 As we proceeded into southeastern France, we found the same condition of intensive use of the land on valley floors and on the slopes, which are terraced up to steep gradients. We saw how, in the French Alps, population pressure on land of the plains has pushed the cultivation line up the slopes into mountains and where grassy meadows were overgrazed. This excessive use of the mountainous areas in the French Alps unleashed torrential floods that for more than a century ravaged productive alpine valleys. Erosional debris was swept down by recurring torrential floods to bury fields, orchards and villages, to cut lines of communication and to kill inhabitants of the valleys. So serious became this menace to the welfare of the region that the French Government, after much study and legislation, undertook in 1882 a constructive program of torrent control. Since that time, funds of hundreds of millions of francs have been spent for works of torrent control that are remarkably successful. The French forest engineers have worked out many of the problems that confront us in this new land in the control of torrential floods in mountainous areas. By an intensive study of these problems and solutions in France we may gain much time and save much money in this country in our flood control program. We found where the debris washed out of the mountains had filled up streams in the valleys, causing water tables to rise to damage crops on bordering alluvial lands which are the most fertile and productive in the mountainous region. The lesson here is to keep the soil on the slopes where it belongs, rather than letting erosion impoverish the mountains and damage the valleys. 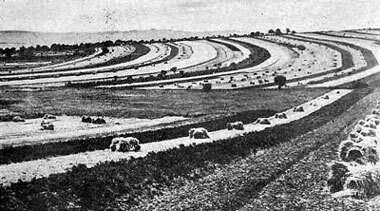 We found slopes in southern France cultivated on gradients up to 100 per cent, where terrace walls were as high as the benches were wide. Some of these terraced fields had been under cultivation for more than a thousand years -- and likely much longer, for the Phoenicians are believed to be responsible for terracing in this part of France. 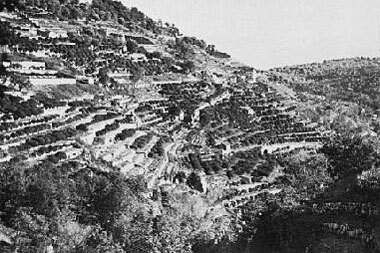 A terraced citrus orchard in southern France. It is believed that terraces of this type were first built in France by the Phoenicians about 2,500 years ago, Modern French farmners are still maintaining and farming such hillsides, however, because of the scarcity of good land. When the soils of these age-old terraces become "fatigued" or tired, as the French say, they are turned over to a depth of more than 3 feet once in 15 to 30 years as the need may be. Thereafter a cover crop is planted on the newly exposed soil material for two or more years, followed by plantings of orchard trees or vines or vegetables. 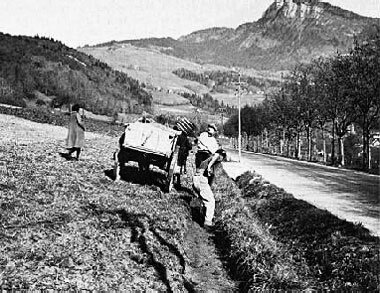 In eastern France we found adjustments of farming to slopes in various stages. In places, terraces are built with rock walls on the contour to reduce slope gradients; elsewhere rock walls are built on the contour to form level benches. But at other places, in the absence of rock walls, we found a remarkable method used for adjusting cultivation to slopes: farmers dug up the bottom furrow of their fields that were laid out in contour strip crops and loaded the soil into carts, hauling it to the upper edges of the fields and dumping it along the upper contour furrows to compensate for down slope movement of soil under the action of plowing and the wash of rain. This was done each year. Where the slope was too steep to haul the soil up hill, we saw the farmers loading the soil of the bottom furrow in baskets and carrying it on their backs to the upper edges of the fields for the same purpose. In this manner do these farmers of France take care of their soil from generation to generation. These French farmers are digging up the soil along the lower furrow of their field and loading it into a cart. It will be hauled uphill and spread along the upper edge. They do this job each winter to help compensate for the downhill movement of soil by erosion. In southeastern France in the region of Les Landes we studied probably the greatest achievement of mankind in the reclamation of sand dunes. It is recorded that the Vandals in 407 A.D. swept through France and destroyed the settlements of the people who in times past had tapped pine trees of the Les Landes region and supplied resin to Rome. Vandal hordes razed the villages, dispersed the population, and set fire to the forests, destroying the cover of a vast sandy area. Prevailing winds from the west began the movement of sand, and in time moving and menacing sand dunes covered an area of more than 400,000 acres that in turn created 2,250,000 acres of marsh land. Sand dunes in their diabolic eastward march covered farms and villages and dammed streams causing marshes to form behind them. The scourge of malaria followed and practically depopulated the once well peopled and productive region. These conditions caused not only disease and death, but impoverishment of the people as well. In 1778 Villers was appointed by the French Government to create a military port at Arcachon. He reported that it was first necessary to conquer the movement of the sand dunes and presented the principle of dune fixation. In 1786, Napoleon appointed his famous engineer, Bremontier, to control these dunes. One of the uncontrolled sand dunes in the Les Landes forest of southwestern France. French engineers have, in the past, brought about 400,000 acres of such dunes under control, and the area is again producing timber. Space will not permit telling the fascinating details of this remarkable story -- of how the dunes were conquered by the establishment of a littoral dune and reforestation of moving sand behind, and how marshy lands were drained by Chambrelent after a long period of experimentation and persuasion of public officials. Now this entire region is one vast forest supporting thriving timber and resin industries and numerous health resorts. Fortunately, for comparison, one dune on private land was for some reason left uncontrolled near Arcachon. This dune is 2 miles long, one-half mile wide and 300 feet high. It is now moving landward covering the forest at the rate of about 65 feet a year. As I stood on this dune, stung by the grains of sand in the teeth of strong winds off the sea, and looked to the north, to the east, and to the south, on an undulating sea of evergreen forest to the horizon, I began to appreciate the magnitude of the achievement of converting a vast menace of disease and death such as the giant sand dune underfoot and marsh lands behind into a saving resource of growing, profitable forests and health resorts. This is another example of adjustments of a people to land resources through land conservation. We followed the westward course of civilization into Holland where we found another of mankind's greatest achievements -- the reclamation of the ocean floor for farming. A view of productive farmland in Holland that was literally reclaimed from the sea. This land was on the floor of the sea only 7 years before this picture was made. The Dutch diked off the sea and leached out the excess salt and minerals at a cost of about $200 per acre. Holland is a land of about eight and a quarter million acres, divided into two almost equal parts -- above and below high tide level, and inhabited by eight million industrious people. Its land includes the great delta of the North Sea built up with the products of erosion sculptured out of the lands of Germany and Switzerland and northeastern France; brought down on the Rhine, and Meuse Rivers. Now 45 per cent of the area lies below high tide level and one fourth lies below mean sea level. The Dutch from time immemorial have been carrying on an unending battle with the sea. They have become expert in filching land from the grasp of the angry waters of the North Sea. The density of population of Holland per square mile of cultivated area is such that on the same basis the population of the United States would be one and a quarter billion people. This comparison, however, is unfair in some particulars for much of Holland is kept in permanent grass to support a thriving dairy industry. At any rate, the density of population of Holland has called for an increase of their land area. Rather than to seek additional land by conquest of their neighbors they have turned to the conquest of the sea. The Zuider Zee Project, two centuries in the planning, is their masterpiece in their two-thousand-year battle with the North Sea. When completed, this project will add 500,000 acres of new land to Holland's territory and will convert the old salt Zuider Zee into a sweet water lake renamed the Yssel Meer. A Dutch farm in the Wieringermeer Polder of the Netherlands. Only 7 years before this picture was taken this land was covered by the North Sea. The Dutch have built great dikes to dam off the sea and have pumped the water out of the basins with great pumping plants. They have diked off the sea and de-watered the land, leached it of its salt, and converted it into productive farm land. We stood on fertile farmland that was the floor of the sea only 7 years earlier, that now is divided into farms equipped with fine houses and great barns. At a cost of about $200 an acre, this land was reclaimed from the sea and divided into farms equipped with modern villages to supply all services for rural communities. The Dutch by this means have created a new agricultural paradise into which only select farmers may enter. Laughingly, I told the manager of the Wieringermeer Polder that he was the St. Peter of this new, agricultural heaven on earth. Out of 30 applications for each farm he selects one on the basis of his character, the past record of his family and his freedom from debt. The successful applicant is put on probation for a period of 6 years and if he farms the land in accordance with the best interests of the land and of the country, he will be permitted to continue for another period. If he fails to do so, he must get off and give another farmer applicant a chance. This thoroughly planned and perfectly executed project is without question the greatest achievement of mankind thus far in the reclamation of land for farm use. We do not know exactly how much this magnificent project was damaged by the invasion of Holland and partial flooding of the land during the recent war. As we follow the westward course of civilization into the mild climate of England, we find that tillers of soil here have had little difficulty with soil erosion, for rains come as mists and slopes are gentle and fields are usually farmed to close-growing crops of small grains. England is well suited to grassland farming and to the growing of small grains. 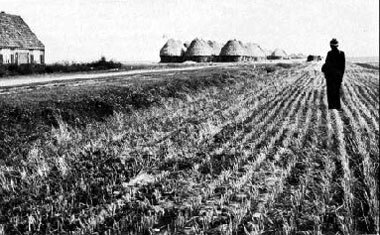 Clean-tilled crops have never been in general use. So we found fields in England that have been cultivated for 1000 years or more where the yields of wheat have been raised to averages between 40 to 60 bushels per acre. The maximum yield thus far is 96 bushels to the acre. The principal problems before the farmers of England are rotations, seed selection and farm implements. Contour strip cropping in southwestern Germany. Some farmers of Europe have been using this method to help control erosion for hundreds of years. The recent war made new demands on the lands of England. Prior to blockading action by the enemy, the British Isles depended on imports for two-thirds of their total food supply. One-third of their population was fed from their own lands, requiring about 12 million acres of cultivated land for this purpose. 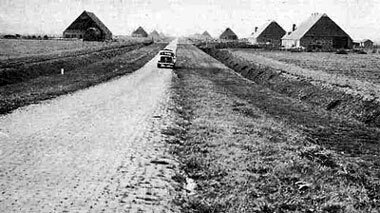 In war time, fully 50 per cent more land was plowed to grow food crops; and most of it is still in cultivation. Pasture land and grassland on slopes are being cultivated. Soil erosion may become a problem more serious than ever before in British agriculture, because of the extraordinary demands for the growing of food. And now we cross the Atlantic, following the course of civilization to the new land which by one of the most remarkable facts of history was kept for the most part isolated from the peoples of the Old World until civilization had advanced through a period of fully 6000 years. The peoples found here, presumably descendants of tribes coming from Asia in the distant past, had been handicapped in the development of agriculture by lack of large animals suitable for domestication and by ignorance of the wheel or the use of iron. They had, however, learned to conserve water and soils in a notable way, especially in the terrace agriculture of Peru and Central America and in the Hopi country of Southwestern United States. Some have held that this knowledge was brought across the South Pacific by way of islands, on many of which such practices are still found. In any case, lacking iron or even bronze tools, these peoples for the most part still depended largely on hunting, fishing and gathering along with shifting cultivation for their livelihood, and the soil resources seem to have been for the most part almost unimpaired. To the peoples of the Old World, the Americas were a land of promise, a release from the oppressions, economic and political, brought on by congested populations and failures of peoples to find righteous adjustments to their long used land resources. North America, as the first colonists entered it, was a vast area of good land, more bountiful in raw materials for a complex civilization than ever was vouchsafed any people. "The spacious Mississippi Valley is the most expansive habitation of mankind in the world," says the historian, Henry Truslow Adams. Its soils were fat with accumulated fertility of the ages; its mountains were full of mineral; its forests of timber; its clear rivers were teeming with fish. All these were abundant -- soil productivity, raw materials, and power for a remarkable civilization. How new is this land in comparison with the Holy Lands? The hardy pioneers, who first settled the eastern seaboard and then the west, found a land beautiful for its rocks and rills, for its forests and valleys and for its majestic purple mountains; beautiful for its wide open plains and spacious skies; for the majesty of its scenery in lakes and snow-capped mountains. Our forefathers found a land wonderful for indescribable grandeur of scenery; wonderful for its great expanse as they continued the westward course of civilization to the shores of the Pacific. Here was the last frontier of this westward march; for there are no more new continents to discover, to explore and to exploit. If we are to discover a way of establishing an enduring civilization we must do it here, for this is our last stand! We have not yet fully discovered this way; we are searching for the way and the light. Here is a challenge of the ages to old and young alike; a chance to solve this age-old problem of establishing an enduring civilization -- of finding a righteous adjustment of a people to its land resources. Our land is like a great farm, plentiful for fields suited to the growing of cotton, corn, and other crops, plentiful in land for pastures, woods, and general farming. In the West, our country is plentiful for vast grazing lands well suited to the raising of herds of sheep and cattle, and plentiful for fertile alluvial valleys of the arid regions over-awed by high mountains that condense the waters out of moisture-laden winds, to irrigate garden lands of high yields. Such is the American farm, plentiful for feeding at least 350 million people when the land is intensively cultivated under full conservation and fully occupied with a complex division of labor that will give us a higher general standard of living than we enjoy today. But now let us read the record that we have written on our own land in a very short period of 300 years. In the past 150 years, our occupation of this fabulous land has coincided with the coming of the age of science and power-driven machines. By our understanding of a power over materials and forces of nature, we have been able to rip up the earth more rapidly than ever before in the history of the human race. Along the Atlantic Coast in the Piedmont we find charming landscapes of fields with red soils and glowing grain fields, but lo! in their midst we find an insidious enemy devouring the land -- stealing it away, ere we are aware, by sheet erosion, rain by rain -- washing it down into the streams and out to the sea. Sheet erosion, marked by shallow but numberless rills in our fields, is blotted out by each plowing, so that we soon forget what is happening to the good earth until we measure these soil and water losses. More than 300 million acres out of our 400 odd millions of acres of farm fields are now eroding faster than soil is being formed. That means destruction of the land if erosion is not controlled. We are not guessing, for erosion experiment stations located throughout the country in problem areas of soil wastage, have given us accurate results. Let us compare rates of erosion under different conditions of land coverage and use. Measurements through five years at the Statesville, North Carolina Erosion Experiment Station show that, on an 8 per cent slope, land in fallow without cropping lost each year an average of 29 per cent of rainfall in immediate runoff and 64 tons of soil per acre in wash-off of soil. This means that in 18 years, 7 inches of soil (the average depth of top soil) would be washed away to subsoil. Under continuous cropping to cotton, as was once the general practice in this region, the land lost each year an average of 10 per cent of rainfall and 22 tons of soil per year, which means that it would take 44 years to erode away 7 inches of soil. Rotations reduced but did not stop erosion, for the land lost 9 per cent of the rain and enough soil that it would take 109 years to erode away 7 inches of soil. That is a very short time in the life of our nation. But where the land was kept in grass, it lost less than one per cent of beneficent rain and a mere fraction of a ton of soil per year so that it would take 96,000 years to wash away 7 inches of soil; this rate is certainly no faster than soil is formed. Under the natural cover of woods, burned over annually, as has unfortunately been the custom in southern woods, the land lost 3 1/2 per cent of rain and six-tenths of a ton of soil per year, so that it would take 1800 years to erode away 7 inches of soil. But where fire was kept out of the, woods, and forest litter accumulated on the forest floor, the land lost less than one-third of one per cent of the rainfall and an infinitesimal amount of soil, so that, according to the calculations, it would require more than 500,000 years to wash away 7 inches of soil. Such an infinitesimal rate of erosion is indeed far below the rate of soil formation. Here in, a nutshell, so to speak, we have the underlying hazard of civilization. By clearing and cultivating sloping lands -- for most of our lands are more or less sloping -- we expose soils to accelerated erosion by water or by wind and sometimes by both water and wind. In doing this we enter upon a regime of self-destructive agriculture. The direful results of this suicidal agriculture have in the past been escaped by migration to new lands or, where this was not feasible, by the most extraordinary works of terracing slopes with rock walls as was done in ancient Phoenicia, Peru, and China. Escape to new lands is no longer a way out. We are brought face to face today with the necessity of finding out how to establish permanent agriculture on our farms under cultivation before they are damaged beyond reclamation, and before the food supply of a growing population becomes deficient. Within a new and underpopulated land such as is ours that is farmed extensively rather than intensively, there is considerable slack before privations on a national scale will overtake us. But privations of individual farm families, resulting from wastage of soil by erosion, are indicators of what will come to the nation as our population increases. Farm production goes down from depletion of soil resources, unless measures of soil conservation are put into effect throughout the length and breadth of the land. We must be in possession of a certain amount of abundance to be provident, for a starving farmer will eat his seed grain; you will do it and I will do it, even though we know it to be fatal to next year's crop. Now is the time, while we still have much good land still capable of restoration to full or greater productivity, to carry through a full program of soil and water conservation. Such is necessary for building here a civilization that will not fall as have others whose ruins we have studied in this paper. A formerly productive field in Virginia that has been cut to pieces by gully erosion. 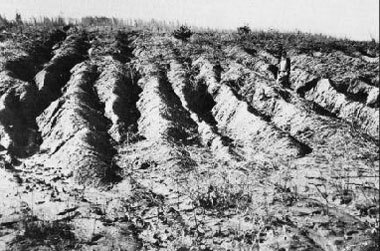 About 50 million acres of good farm land in the United States have been ruined for further practical cultivation by similar types of erosion. 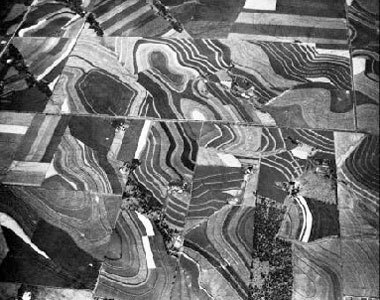 A solution to the problem of the farming of lands with more or less slope must be found if we are to establish an enduring agriculture in the United States. We have only about 100 million acres of flat alluvial lands where the erosion hazard is negligible out of 450 million acres of land that will ever be suitable for crops. Most of our production comes from sloping lands where the hazard of soil erosion is ever present, calling urgently for the discovery, adaptation, and application of measures for conserving our soils. In the results of the Statesville Erosion Experiment Station we saw how a forest with its ground litter was effective in keeping down the rate of soil erosion well within rates of soil formation. Out of untold ages of unending reactions between forces of erosion that wear down the land and forces of plant growth that build up the land through vegetation, the layer of forest litter has proved to be the most effective natural agent in reducing surface wash of soil to a minimum. Here is clearly our objective for permanent agriculture, namely, to safeguard the physical body of the soil resource and keep down erosion wastage under cultivation as nearly as possible to this geologic norm of erosion under natural vegetation. A few years ago I came upon a hill farmer in an obscure part of the mountains of Georgia, who was trying to apply on his corn field the function of forest litter as he saw it under the nearby forest on the same slope and same type of soil. It was for me a great experience to sit down with J. Mack Gowder of Hall County, Georgia, in his forest beside the fields he had cultivated for 20 years in a way that has caught the imagination of thoughtful agriculturists of the nation. We talked about the simple device of forest ground litter and how effective it is in preventing soil erosion even on steep slopes, and how he thought that if litter at the ground surface would work in the forest it ought also to work on his cultivated fields just along the same slope. Mr. Gowder told me how, as a young man when he bought this steep wooded land more than 20 years ago, he hoped to avoid the soil erosion that was ruining the farms on smoother and better land of the country. He planned to do this by stirring his land with deep plowing but without turning the soil, so as to leave his crop litter at the surface -- to do the same kind of work that the forest litter had done from time out of mind. Gowder chose a bull tongue plow, only 4 inches wide to do the trick. He told me that his neighbors laughed at him for such foolish ways of plowing. As a concession to customs of the region he put in channel terraces with a slight grade, as a precaution against storm runoff from unusual rains. But thus far they have not been needed. This prosperous American farm is being farmed the conservation way. The terraces, strip crops, contour rows, and other soil and water conservation measures protect the land against erosion and help to build up soil fertility. Now Gowder is cultivating topsoil on slopes up to 17 per cent whereas his ridiculing neighbors have only subsoil to farm, for they have lost all their topsoil by erosion. Leaving crop litter which is sometimes called "stubble mulch" and "crop residue" at the ground surface in farming operations, is one of the most significant and important contributions to American agriculture and deserves to be spread wide through the country. Certain adaptations of the method need to be made to meet the problems of different farming regions, but the new principle is the contribution of importance. There is not time to go into variations of the Gowder crop litter method of farming, except to herald it as a discovery as important to agriculture of the New World and these times as the invention of the plow was to the Old World. Sheet erosion develops into gullies if allowed to continue unchecked for a few years. Such gullies become numberless gutters to lead off storm waters and flash floods that gouge out miniature gorges and ruin the land for further cultivation. Material washed out of such gullies is swept down into river valleys to shoal streams, to fill reservoirs, and to destroy water storage for hydro-electric power and for irrigation. One of the most important findings of this survey of the use of land in 7000 years is that tillers of soil have encountered their greatest problem throughout the ages in trying to establish a permanent agriculture on sloping lands. We have read the record as written on the land, of failures from place to place but of few instances of success. This same problem is with us in our new land of America, where millions of acres have been destroyed for further cultivation and abandoned. 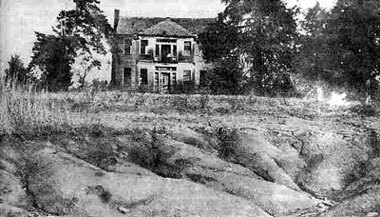 This formerly fine American farm home has been abandoned for much the same reason that many cities of the old world were abandoned -- the eroded land around it will no longer support a prosperous farm family. How then shall we continue to support fair cities and beautiful homes by agriculture on sloping lands of this country? Shall we resort to methods of ancient Phoenicia where slopes are terraced by building rock walls as a staircase to make lands level at an expense of $2000 to $5000 an acre? We say this is too costly even if we had the stone in place to build such terrace walls, but across our great land there is not enough stone within reach of eroding fields to terrace our land in this manner even if it were justifiable in cost. We must find some other solution to the age-old problem of slope cultivation. We have a solution to this problem derived from the past experiences of farmers and from the results of experiments in our soil erosion experiment stations. This solution is contour farming supported by all other conservation measures. Our answer is contour farming, supported by necessary measures first to increase the intake capacity of the soil for rain waters by practices of retaining crop litter at the surface, soil improvement, crop rotations, and strip cropping on the contour; and second to lead away unabsorbed storm waters harmlessly in channels of broad base terraces into outlet channels and thence into natural drainage channels. By these coordinated measures applied and adapted to the land on a physiographic basis we have developed a new type of farming on the level rather than farming up and down the hill. This is our solution to reduce the rate of erosion to safeguard our soils on slopes where soil erosion by water is the hazard. We have applied this method, during recent years, over millions of acres as you may see from an airplane when you fly over portions of the country. This airplane view shows parts of six different farms near Temple, Tex., where the farmers have banded together to combat erosion as a community problem. In Texas near Temple, in the drainage of North Elm Creek, 174 farmers of bordering farms joined themselves into a soil conservation association on a drainage basis covering a block of 34,000 acres. 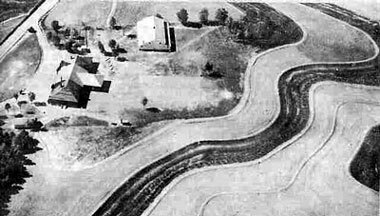 Control of erosion and of storm runoff was planned and carried out on a drainage basis, ignoring property and county lines in the same way as runoff water ignores such arbitrary lines. Terrace outlet channels were laid out to carry water harmlessly through one farm and another to natural drainage channels. One terrace outlet system may serve in this way as many as 5 farms. By this approach to conservation it is possible to treat the land in accord with its adaptabilities and to control storm waters according to hydraulic principles. This is indeed physiographic engineering that builds a lasting basis for a thriving civilization. This does not mean that we have yet found the final answer to full control of soil erosion that will assure permanent agriculture, but we are on the way to that solution. Our present practices may not yet stop erosion, but will reduce it more and more as application of measures is more and more complete. These measures and others will need further improvement and adaptation to the problems as use of land becomes more and more intensive. Such is the way out to this age-old problem of establishing an enduring agriculture on sloping lands. It is true that our level lands of the alluvial valleys have their problems of drainage both in the irrigated and rain supplied area. But these problems do not include the wastage of the physical body of the soil resource. The soil remains in these flat lands, leaving us the freedom of choice of drainage when the lands are economically ripe for us. Our chief problem among many in the land conservation movement in the United States is to conserve lands under cultivation and grazing on slopes. Wind erosion is a spectacular problem restricted to a smaller area of the country where it is, however, serious and destructive. Wind erosion attacks level as well as sloping lands cultivated in semi-humid and semi-arid parts of the country. Wind erosion sorts the soil more thoroughly than water erosion, lifting fine and fertile particles of soil aloft to be flown to "parts unknown" and leaving behind coarser and heavier particles that become sandy hummocks, then sand dunes that begin an inexorable march of destruction. Such was the case in the so-called "dust bowl" of the Great Plains. Control of wind erosion is based first upon a suiting of the land to its capabilities, by conserving all or most all of the rain that falls on it, which calls for contour farming except on flat lands. Appropriate measures include strip shelter belts of crops, tillage practices that leave crop litter or residue at the surface, and rotations suited to moisture supplies in the soil profile. These with progressive improvement of soil management practices will control wind erosion. It has proved a simpler task, however, to control wind erosion than the less spectacular but more insidious water erosion. In this discussion on lessons from the Old and New Worlds in conserving the vital heritage of our people, I have laid special emphasis on saving the physical body of soil resources rather than their fertility, for the following reason. Soil conservation must be a cooperative objective and undertaking. Maintenance of fertility is a part of this cooperative enterprise that falls properly to the farmer himself. Conserving the physical integrity of the soil resource falls to the nation as well as the farmer and landowner, in order to save the people's heritage and safeguard the national welfare. If the physical body of the soil resource is saved, we as a people are safeguarded in liberty of action, in applying more or less fertilizer, and of planting this or that crop in accord with market demands and national needs. If the soil is destroyed, then our liberty of choice and action are gone, condemning this and future generations to needless privations and dangers. So big is this job of saving our good lands from further damage and of reclaiming to some useful purpose vast areas of seriously damaged and ruined lands, that full cooperation of the individual interest of farmers with technical leadership and assistance of the Government is not only desirable, but necessary, if we are to succeed. Another conclusion from our survey of the use of land through 7000 years where economic conditions have changed for better or for worse more rapidly than climate, is that land after all is not an economic commodity. It is an integral part of the nation even as its people are and requires protection by the individual owner and by the nation as well. Nowhere have we found more telling evidence of this truth than in California where gold in '49 lured a host of people to the State, but soils of its valleys have maintained its settlement. It was said in times of old: "Thar's gold in them thar hills," but there was more than gold in the valleys. In the vicinity of Sacramento a few years ago when I examined this area, valley lands had a value of $69 an acre for growing winter wheat with natural rainfall. But these lands overlaid gravels, and in these gravels was gold; so a dredging company bought up the land, paying $200 an acre for it. The company brought in mighty dredges to turn the land upside down to get out the gold and left these farming lands in windrows of quartzitic boulders that will not weather in a million years. What sort of economics is this: what shall it profit a nation if it gain a whole world of gold and lose its soil? Thou shalt inherit the holy earth as a faithful steward, conserving its resources and productivity from generation to generation. Thou shalt safeguard thy fields from soil erosion, thy living waters from drying up, thy forests from desolation, and protect thy hills from overgrazing by thy herds, that thy descendants may have abundance forever. If any shall fail in this stewardship of the land thy fruitful fields shall become sterile stony ground and wasting gullies, and thy descendants shall decrease and live in poverty or perish from off the face of the earth.